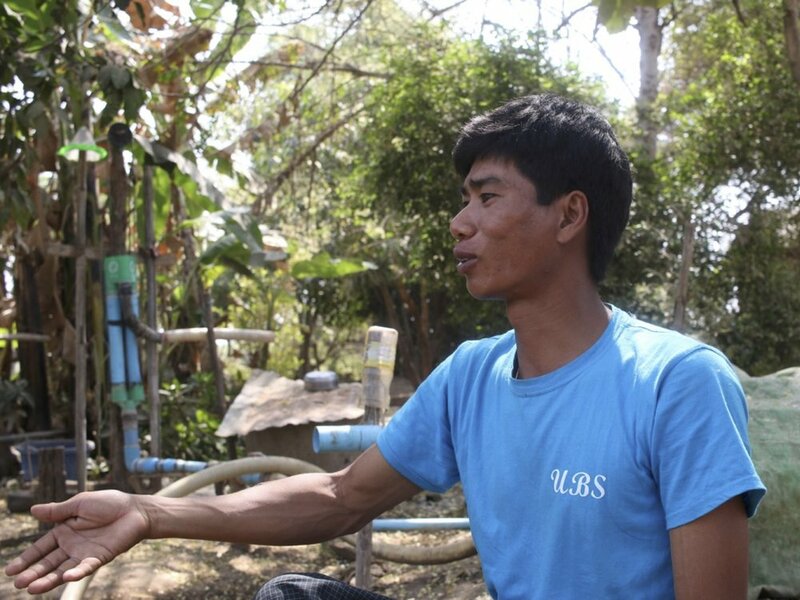 how can precision farming technology impact low-income farmers in Myanmar? 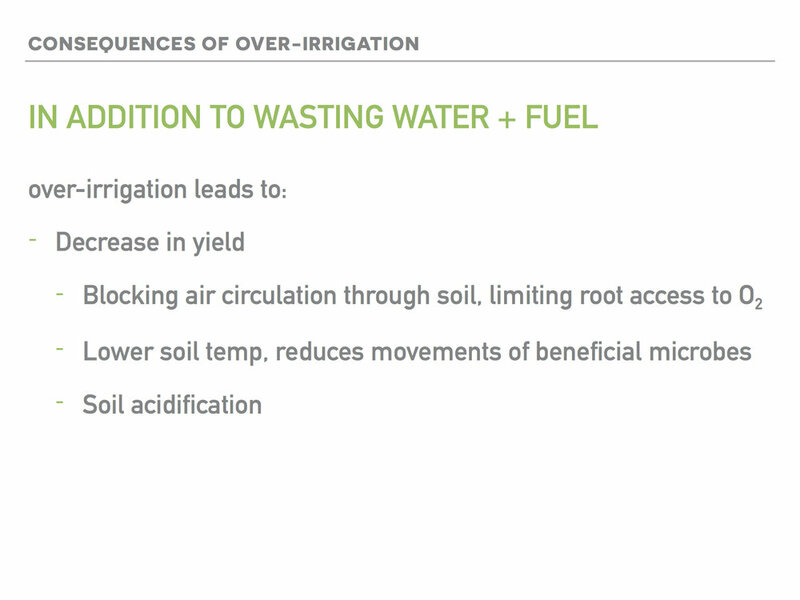 It’s likely that you don’t spend your days thinking about fertilizer. 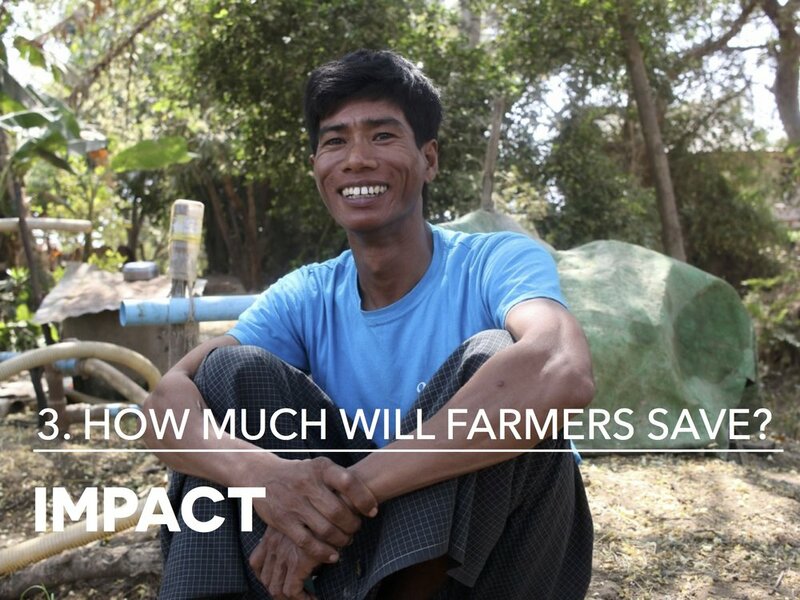 For smallholder farmers in Myanmar, however, adding the right fertilizer at the right time can determine whether a family will be able to afford food, healthcare or education. 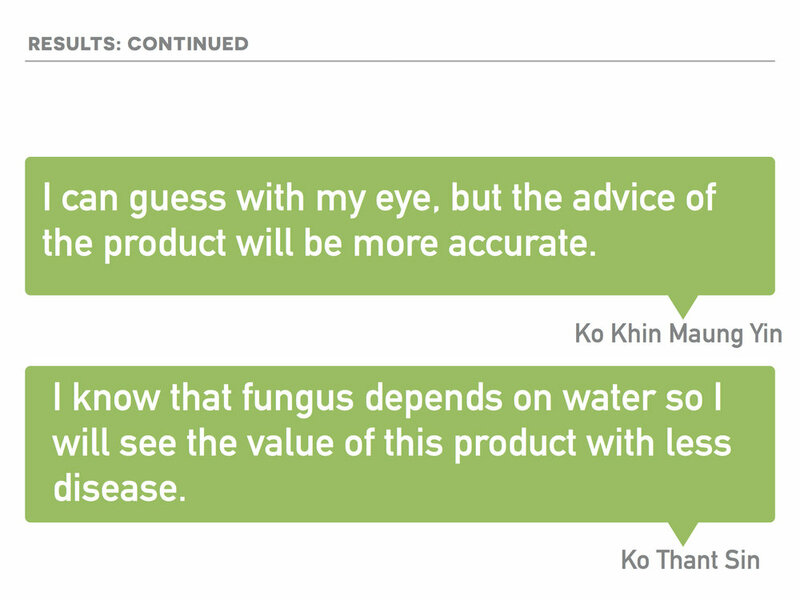 In fact, Myanmar farmers make daily, difficult decisions, not just about fertilizer, but about fungicide, seeds, when to plant, how much to water, what pest or disease is affecting their crops and how to tackle it. 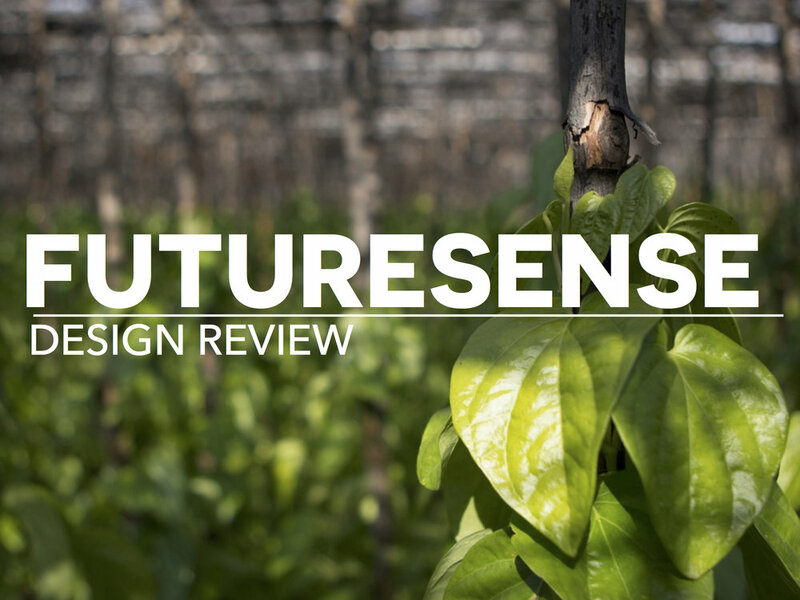 If making these decisions in a place like the US is difficult, making them in a data-poor environment where fertilizers and pesticides are often adulterated and where internet is only starting to take hold can be akin to taking a shot in the dark. 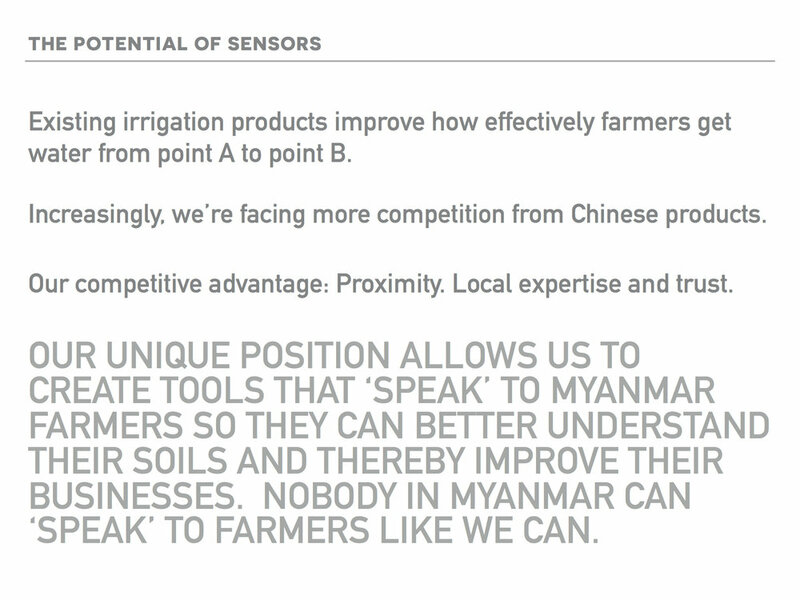 In a joint collaboration between Proximity and IDEO.org, we* asked how the increasingly affordable technology behind precision farming could help Myanmar farmers make more informed crop management decisions. 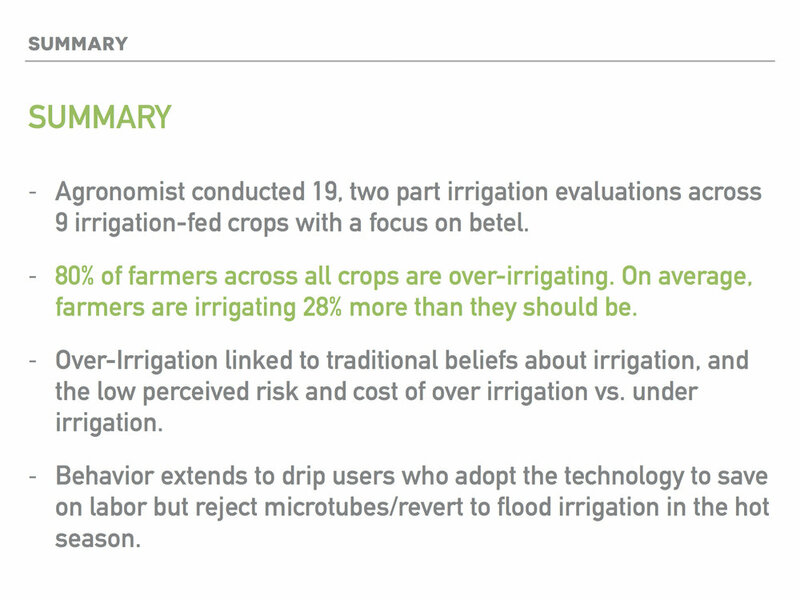 We started broad, using card games to help us uncover just what factors farmers felt most contributed to their crops’ success, and used that information to build three prototypes. Building on IDEO.org’s work, I enlisted five individuals who came from different teams within Proximity to further service design and assess the potential financial impact these prototypes could generate on the farmers who used them. 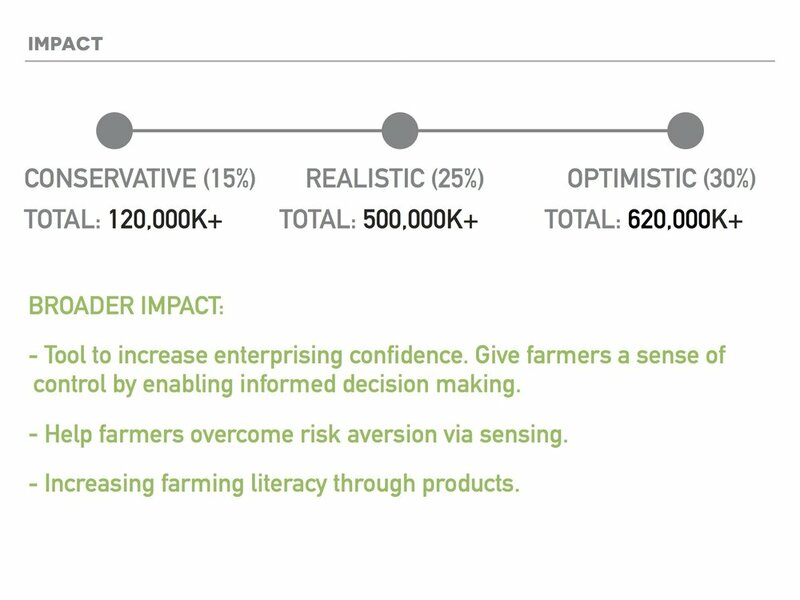 As a social enterprise, impact is Proximity’s bottom line, and we needed to quantify the savings our products would generate for farmers. 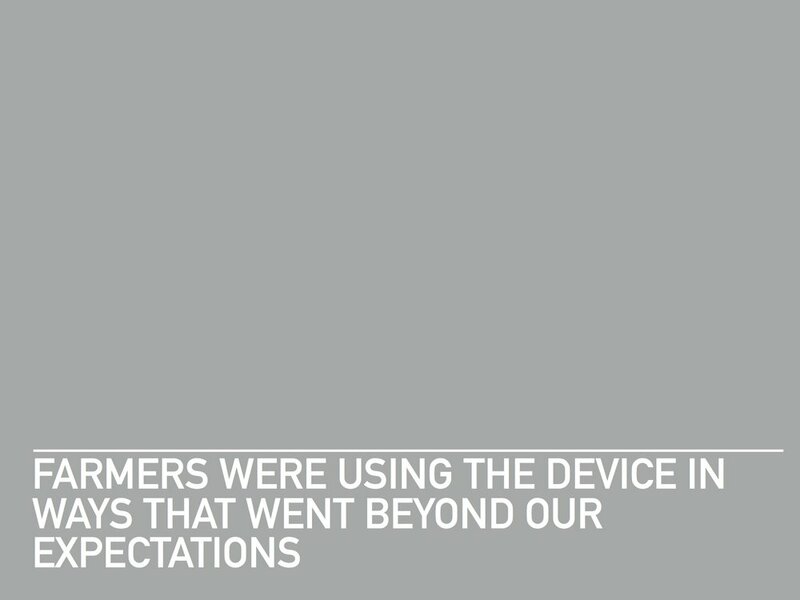 We agreed on the central assumptions behind the prototype products and designed tests to verify whether those assumptions would hold. 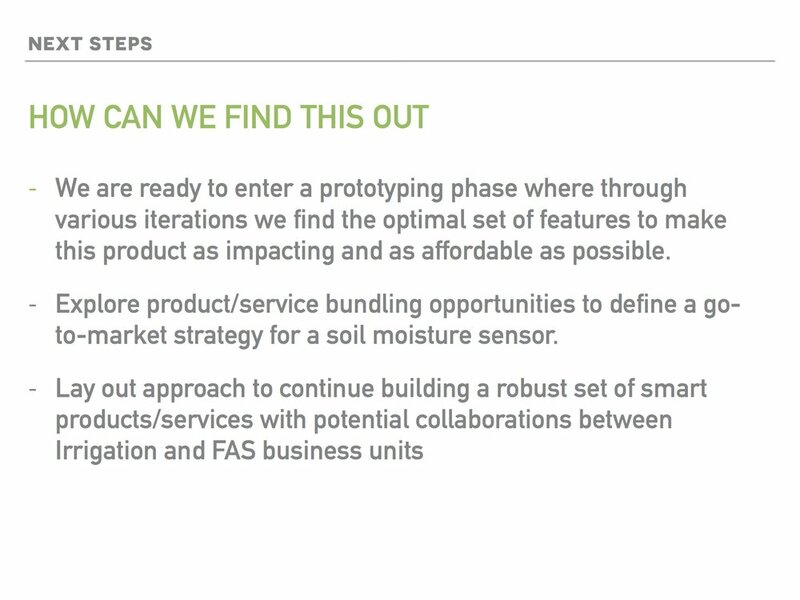 We selected off-the-shelf-sensors and sold them, walked around farmers’ fields to get a sense of how GPS mapping software would work, we grew our own betel to test its sensitivity to moisture, we built prototype apps to observe how farmers interacted with online forms and drop down menus, we woke up early in the morning to help farmers water their fields, and we enlisted the help of an agronomist to create a comprehensive survey of every single input farmers’ used in their fields. 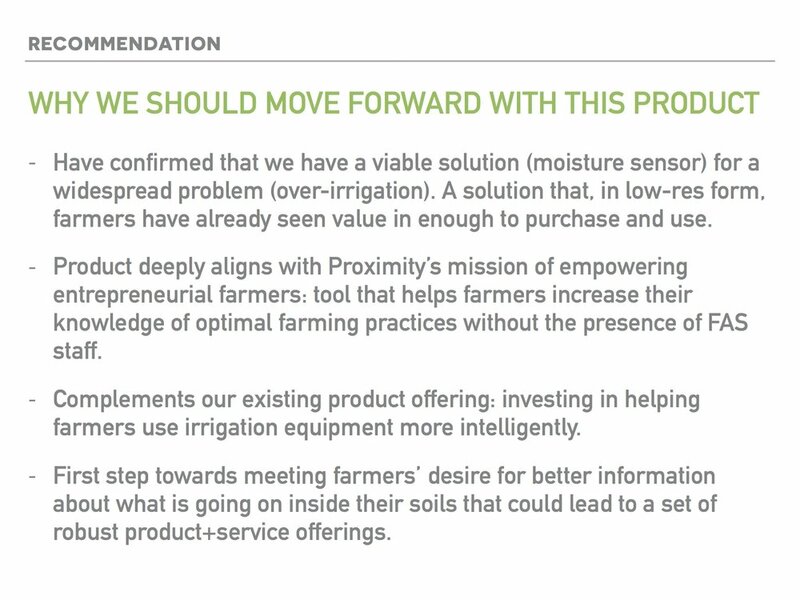 Our work resulted in an affordable moisture sensor that is projected to reduce farmer fungicide use by 30% and that is expected to launch in 2017. 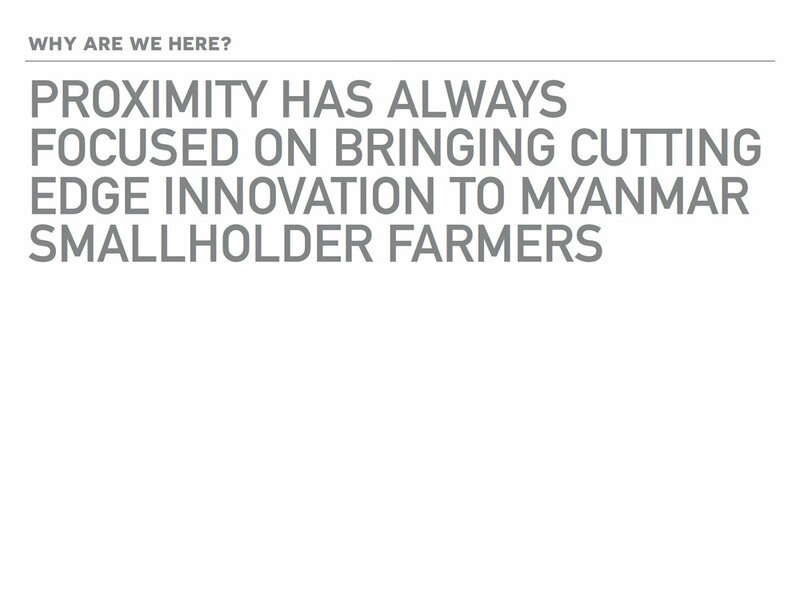 More importantly, however, Proximity has shifted its product design strategy to develop a series of products and services that leverage its manufacturing capability and its agricultural extension team to provide Myanmar farmers with tools to better understand what's going on beneath their soils and make better decisions about how to manage their crops. 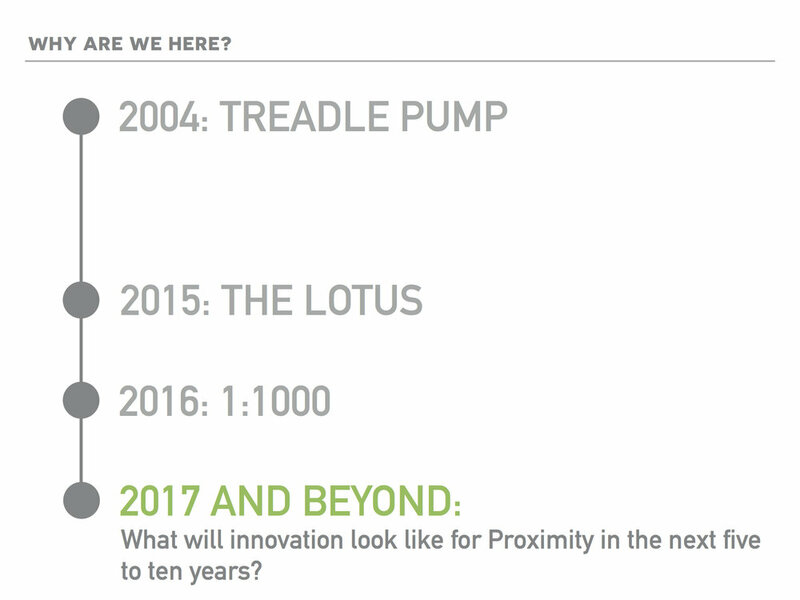 *I hesitate to take individual credit for work that resulted from incredible collaborations with an amazing team, hence the widespread use of "we" in the writing above. John Collery, Barry Lachapelle, Natalia Sourdis, Adam Reineck, Maddie Kau, Kaungset lin, Elaine Cheung, Aung Kyaw Moe, Su Lynn Myat, and Thein Soe Min, have all contributed to this work, which is being continued by Tayzar Lin, Louisa Richards, and Taiei Harimoto.